Ride the waves, sun bake and relax. Let time fly by in a dream of turquoise water and green islands. And when you hear your inner call for action, bring out the movie star inside you. Drive the sea scooter to find Nemo or 'work out' your abs while stand up paddling in a serene bay. Our tour takes you right amongst the nicest Whitsunday Islands. Each tour visits the beautiful Whitehaven Beach on Whitsunday Island. A short walk takes you up the Hill Inlet Lookout, from where you have a breathtaking view over Whitehaven Beach. Plenty of 'sand experience' time is to be had on Whitehaven Beach. The tour further stops in various of the dreamy Whitsunday Bays for snorkelling. Underwater you will find a whole world of itself, full of colourful corals and fish. Our SeaScooter will turn the most convinced landlubber into a marine biologist. The Whitsunday waters are a scenic place to learn Stand Up Paddling (SUP). This watersports activity provides a great nature experience. Just being out there: you, a board and a paddle. And for the ones looking for total relaxation, there's plenty of sun lounging space or shaded seating for that holiday book. Bred from a french catamaran racing heritage, On Ice combines catamaran sailing and comfort cruising in perfect harmony. Her rounded curves glide effortless over the water. Feel wind and waves on the foredeck net or sit back on the cushioned seats of the shaded back deck. The high hulls make it easy to spot marine life. Inside you find a spacious saloon and lots of cabin space to chill out. Overall Length - 14.2m / 46ft. Sail Area - 98.5 sq. m.
1. Sail to Hook Passage (overnight anchorage). 3. Tongue Bay (Hill Inlet Lookout & Whitehaven Beach). 4. Stonehaven Bay Hook Island (overnight anchorage). 5. Blue Pearl Bay Hayman Island (snorkel). 6. Sail back to Airlie Beach. A friendly ISail Crew member will pick you up at 4pm from the meeting area around the Marina Kiosk of the Northern Abel Point Marina, Shingly Drive, Airlie Beach (roundabout end). Pack light. You can store your luggage at check in. You’ll get taken to the boat, shown your accommodation and given a short introduction of the crew and the boat … and then you are heading out to sea. On Ice sets off to the Whitsunday Islands and after a brief sailing introduction you and your fellow sailors will enjoy a sunset sail. Feel free to grab a drink. A snack (entree) will be served after dropping sails. The evenings are for relaxing, socialising or star gazing. A generous buffet dinner will also be served. This is a great time to exchange travel tales or ask the crew about marine life. Start the day with the smell of coffee. Breakfast is ready for you at 7am. After breakfast the tour heads to the 1st snorkelling location. ISail snorkels in bays protected from wind and waves (e.g. Dumbbell Island). Listen to the snorkel brief, then put on your snorkel suit and grab a mask. Or how about trying out the SeaScooter, effortless gliding through the water chasing fish. Our crew will drive you directly to the corals and fish with the inflatable dinghy (rubber ducky). Your snorkel guide will stay with you the whole time to watch over you and assist you. Enjoy the great underwater world with peace of mind. Go for a relaxing paddle in a bay. Just you and your board immersed in nature. From Tongue Bay on Whitsunday Island we will explore Whitehaven Beach. Our crew drives you over to Whitsunday Island to the start of the Lookout walk. After a short bush walk you will enjoy the most magnificent views from Hill Inlet Lookout. On the other side of Tongue Point awaits Whitehaven Beach. Enjoy some time here relaxing, sun baking and swimming. After breakfast, enjoy another snorkel site on the morning of your last day in the Whitsunday Islands (e.g. Hayman Island’s Blue Pearl Bay). A big morning tea follows. 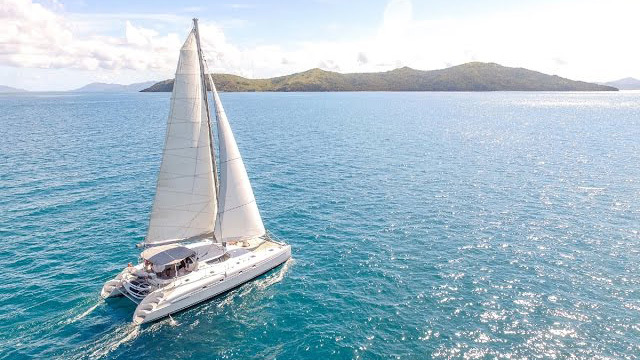 Get ready for another exciting sail adventure back to Airlie Beach. *Itinerary: The itinerary is only intended as a guide as what to expect .Each tour visits Whitehaven Beach and Hill Inlet Lookout. In order to make the best of your tour, snorkel and overnight locations will vary due to wind, weather and tidal conditions. The skipper selects the best locations for the individual day. We reserve the right to change itinerary and vessel without notice. Please view the full Terms & Conditions here. Appetizers: Hot Samosas, served with asian dipping sauces. Dinner: Honey Lime Baked Tasmanian Salmon served with Marbled Rustic Mashed Sweet Potatoes, Seasonal Green Vegetables and Peri Peri Aoili. Breakfast: Percolated Espresso Coffee, Black Tea, Milk, Orange Juice; Freshly Chopped Fruit Salad, Hot English Muffins with a variety of Spreads and Cereals. Morning Tea: Percolated Espresso Coffee, Black Tea, Milk; Dreamy Choc Chip Cookie; Apple Slices. Lunch: Seasoned Roast Chicken Quarters, our world famous Potato Salad, Baby Spinach Leaf Salad with Feta, Cucumber and Tomatoes. Appetizers: Cheese Platter with Brie, Australian Vintage Cheddar, Olives, Salami, Crackers and Roast Pumpkin Onion Cashew Dip. Dinner: Gnocchi Amatriciana (Bacon, Capers, Cherry Tomatoes ), Mixed Italian Salad, Homemade Garlic Bread and Parmesan. Morning Tea: Percolated Espresso Coffee, Black Tea, Milk; Lamingtons (Australian Biscuit Cake), Orange Slices. Lunch: Gourmet Deli Wraps with salami. *Common Special Diets and Food Allergies are catered for if advised upon booking or re-confirmation. Please enquire upon booking if unsure. We reserve the right to change the menu at any time without notice. Pricing may change based on date of travel. All taxes, fees, levies, meals, linen, bath towel, wetsuit/lycrasuit. Double Berths and cabins are twin share. "Open dated" tickets please give 14 days notice to book. All bookings bookings due to availability. Please re-confirm your arrival 72-48 hours with our check-in office ABC Travel by calling 07 4946 5755 (or email manager@abctravel.net.au). Check-In at ABC Travel, 344 Shute Harbour Rd, main street Airlie Beach between Down Under Bar and NAB Bank: 2 hours prior to departure or any time before. Please contact them or your travel agent, should you run late or go directly to the meeting point in the northern precinct of Abell Point Marina Airlie Beach, Queensland, Australia. NOTE: Pricing may change based on date of travel.